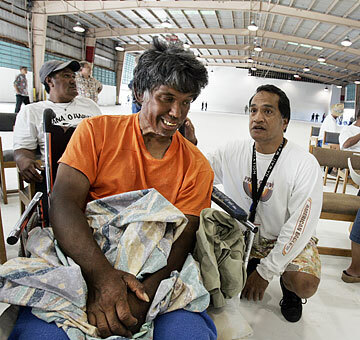 Ezekiel Keliikapakako, left, who planned to spend the night at the shelter, talked yesterday with Mike Keale of the Waikiki Health Center's "Caravan Outreach" program. >> Gov calls mayor's homeless tactic 'pure shibai' Gov. Linda Lingle tears into Mayor Mufi Hannemann on his handling of the homeless issue. More than 100 homeless people moved yesterday from the coziness of church halls to the newest roof over their heads, a warehouse large enough to hold a basketball court and bleachers. The people who arrived to take shelter at the state-owned waterfront building in the Fort Armstrong industrial zone of Kakaako were joined at yesterday's dedication by an equal number of people from homeless support groups and state workers who made the place habitable in a weekend construction and cleaning blitz. The warehouse will be nighttime shelter for people who lived in Ala Moana Beach Park before they were evicted by the city March 27. It was refurbished in a three-day construction project that cost the state about $200,000. 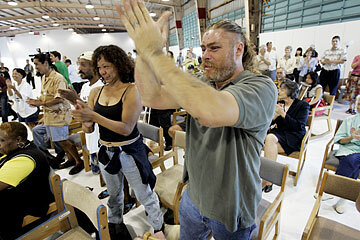 The population of the new shelter will be limited to people who were housed at Central Union Church and Kawaiaha'o Church after the eviction and "anyone else we know came from Ala Moana park," said Laura Thielen, of the Affordable Housing and Homeless Alliance, which was contracted as the lead agency to run the new "Next Step" project. "It will also be open to any families." Identification will be issued to qualified shelter dwellers, and deputy sheriffs will be stationed outside to keep others from dropping in. "Rules will be simple," said Thielen. "Be safe, be respectful, pick up after yourselves. Smoking is outside only. No weapons, no violence, no alcohol, no drugs," she said. "All we're asking is that you give us a chance and work with us," Thielen told the crowd. "We'll figure out where to go from here." Gary Kacker, right, Laurice Alapai and others reacted last night to speakers at a blessing ceremony for a renovated warehouse on Pier 1 that is now a temporary shelter for the homeless. It is a work in progress. Cots and folding mattresses will be provided, but they are still being sought. Storage lockers are planned. For now, people could spread their own bedding on the new white plastic roofing material laid on the floor of the 36,000-square-foot warehouse. Hot dinners will be served nightly, but, said Utu Langi, on-site manager, "at this point we're not sure where the next meal will come from." He is a leader of First United Methodist Church's H-5 Project, which will manage daily operations. H-5 -- Hawaii Helping the Hungry Have Hope -- has been delivering meals in 11 parks weekly. Central Union Church volunteers brought a ham dinner last night. Other groups willing to join the effort may call Langi at 223-5176. Gov. Linda Lingle stressed the project's name. "We want to provide a place that is safe, secure and help you be able to take the next step." The warehouse shelter is not intended to be permanent, she said. "I'm counting on all of you to work hard to make those next steps." Sharon Rose ate dinner in the area where she was to spend the night. The Housing and Community Development Corporation of Hawaii, the state's housing agency, also has put Waikiki Health Center on contract to provide social services for the residents, and hired Phoenix Security, which provided security at the churches. "I still have reservations, but I'm going to try it out," said Leinati Mata'utia. "I'm willing to meet them halfway." She said the people who slept at Kawaiaha'o Church for the past month organized as Ohana O Hawaii to provide unity among themselves and a voice to government. Four small children took the large open space as a terrific running room. Their father, who did not want to be identified, said they had made the move from park to church to warehouse but were trying yesterday to move in with family members rather than stay. "We have this to fall back on." Mark Brousseau said, "It's better than the streets. It's transitional for me." He said all his possessions, including identification, were stolen, and Central Union Church minister Dean Vestal is helping him. "I was desperate. He's given me hope." Lingle told reporters yesterday that it was a "mammoth undertaking" to get the warehouse fit for use. 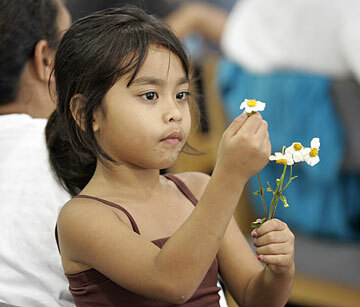 Allyssa Domingo, who was also staying at the shelter with her family, was captivated by some flowers. "Everything was done on the run," said state Comptroller Russ Saito, describing the construction work done Friday through Sunday by Department of Accounting and General Services workers and contractors. Crews built a three-story wall of drywall on metal studs to separate the shelter from a business occupying the other end of the warehouse. The construction included work on the roof, lighting and ventilation, improvements to meet fire code and Americans with Disabilities Act requirements. Three existing restrooms were cleaned and portable toilets brought in. The plastic flooring, laid over an asphalt floor by American Coating Co., was chosen because it can be scrubbed. "You wouldn't believe what this place looked like Friday," said Saito. "It was an extraordinary team effort between DAGS and the contractors. We got more service than we paid for from them." The workers got a big hand when Lingle introduced them, telling the crowd that "they did this not just because it was their job, but because they felt for you. You're not nameless, faceless, homeless individuals. You are human beings we care about."